Not long ago we had the pleasure of photographing Paul Quick, Senior Vice President of Frontier Communications. Based in Dallas, PA, Frontier is a leading telecommunications company employing over 14,000 nationwide. We were pleased to be trusted with such an important role of photographing Mr Quick in an internet data switch room. 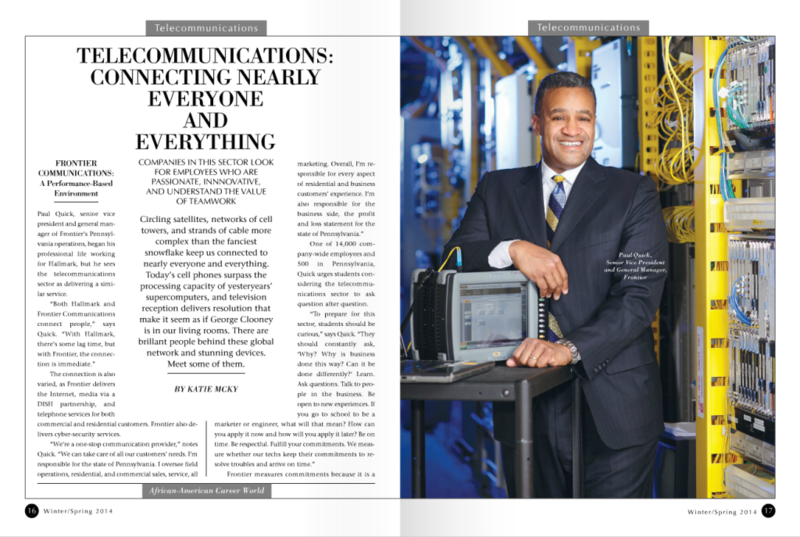 Paul was photographed for African-American Career World Magazine, which In addition to direct subscribers, is distributed by direct request in bulk to all 1,400 four-year universities, 34 top graduate schools, and all 296 accredited engineering schools at their placement offices. Since we are no strangers in location photography, we were set for the task. Our many years working in industrial and technical locations gives us the edge in understanding what is important, what is delicate and where NOT to plug in a light fixture. We are keenly aware of issues such as radio interference and voltage draws that may get other less knowledgeable photographers kicked out fast. This set was lit by four strobes-battery and AC powered and was captured with a Canon DSLR with 100mm f/2 Canon glass. Also, being able to work quickly and adapt to changing events as the “talent” arrives on set is important. Combine all these issues and the challenge could be daunting. Frontier Communications called Earl & Sedor Productions because they knew we could get the job done!